Crickets are a common insect found in almost every area around the world. While it may be seen as odd in the West, crickets are a normal snack food for a lot of people, especially in Asia and Africa. Like other insects, crickets are a wonderful source of protein. Crickets are high in protein yet low in fat and bad cholesterols. If you want a healthy and filling snack, crickets might just be your newest favorite. To read more about crickets, read our article Crickets, An Abundant Source of Protein Worldwide. You might be skeptical when it comes to eating crickets. What if it tastes bad? Well, don’t worry. Crickets taste delicious. It has a nutty flavor with no bad aftertastes. Crickets also absorb the herbs and spices it’s cooked in, making it a versatile ingredient. Crickets can be fried, roasted, baked, or boiled, they taste good either way. Note that crickets should always be cooked thoroughly before consumption since they may contain harmful parasites. 25-50 crickets (or any amount you wish to serve). You can freeze the crickets first to immobilize and kill them if you’d like. Kosher salt for seasoning. Other optional seasonings include garlic powder, black pepper, and cayenne pepper. Preheat the oven to 200 degrees F. Line a baking sheet with parchment paper or buttered/oiled tin foil. Place the crickets on the lined baking sheet. Make sure they don’t overlap each other. Put the baking sheet in the oven and bake the crickets for 45 to 60 minutes, or until dry and crispy enough for your personal taste. To check if the crickets are crisp enough, take out the baking sheet at around the 45-minute mark. Take one cricket and try to crush it with your fingers. The cricket should crumble easily. If the cricket is still not crispy enough for you, bake them a bit longer. 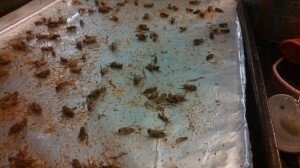 Once roasted to your preference, take the crickets out of the oven and let them sit to cool down. Clean the crickets by taking a few of them and placing them between your palms. Carefully roll the crickets around. The legs and antennae should break off. Continue doing this with the rest of the crickets. Sprinkle salt onto the crickets and give them a toss to make sure the crickets are thoroughly seasoned. Serve the crickets or store them in an air-tight container for later.